These all days since I migrated from Orkut to Facebook, I have been wondering - why Facebook doesn't allow us to write more than 500 characters/words! Suddenly, with the evolution of Google+ I found a nicer platform to share my never ending feelings with more than 500+ characters/words. Yes, it was Google+ who introduced the the upper limit first. Today, we have got a news that Facebook is going to lift the character limitation on status updates, which stands at 500 characters till now. With this latest initiative or say something Facebook has learnt from Google+, the character limitation on Facebook status updates would expands to further 4500 characters/words. So, the latest character limitation in a Facebook status update would be 5000 characters/words which is near equal to unlimited as reflects in the words of Blake Ross - Director of Products and Zach Rait - Software Engineer at Facebook headquarters. 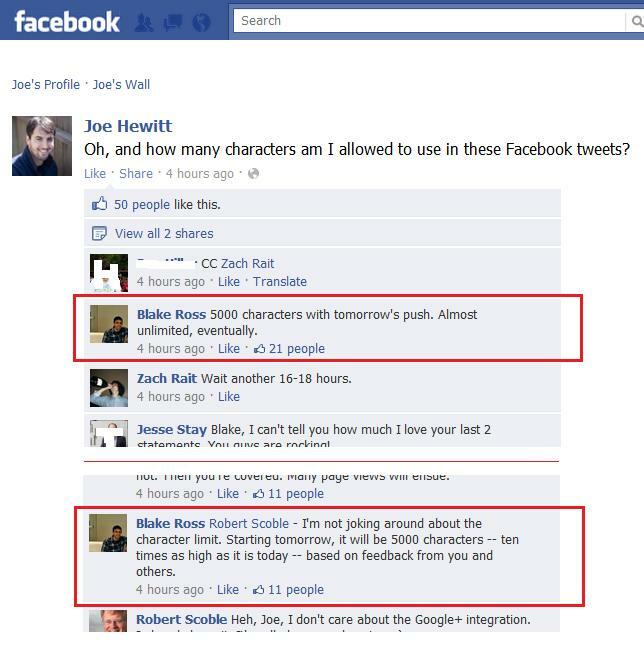 As per the comments from the Blake Ross, Facebook has got several thousands of requests to lift the character limit of 500. Acting on them they have decided to roll-out the new limit of 5000 characters. Starting from tomorrow onward, Facebook will introduce the new push for the upper limit of characters for status updates at 5000 characters. That's what a comment (https://www.facebook.com/joehewitt/posts/913784451473) from Blake Ross says on the status of Joe Hewitt - the developer of the original iPhone Facebook app. With this initiative, Facebook will now be a nicer & wider platform for more of story-telling to suit the vary purposes of individuals to not-for-profit organizations. Probably with this new function, the uncensored marketing community will get an upbeat havoc to promote more of their stuffs and interrupt more with the higher number of tags. So, in my personal view point, along with the spam report feature Facebook should introduce something that restricts the amount of tagging. Though the new authorization feature (when somebody tags you) is a nice alternative yet unholy spirits of marketing should be given a due consideration on tagging limitation. The next limitation that still bears a question in the minds of Facebook platform developers and products developers is the compatibility in the mobile version of Facebook. Would it be good to have a different character limit for the mobile version of Facebook? Well, only people at FB knows. Hopefully Blake Ross, Zach Rait, Joe Hewitt and others at FB might have the answer. Wait till tomorrow and let's see how does the world play around this expanded world of FB status updates. As per the latest reports, Facebook extends its character limit further to a behemoth 63,206 characters.